(Newser) – A lost Boise dog is back home after nine months and a brutal winter alone in the Idaho mountains. 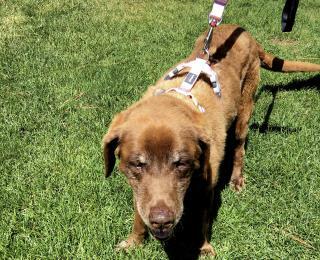 Mo, an elderly Chesapeake Bay retriever, wandered away from her owners during a hunting trip in September, the AP reports. Darwin and Cindy Cameron stayed near the tiny hamlet of Horseshoe Bend, about 30 miles north of Boise, for three months looking for Mo. But deep snow and harsh conditions eventually made the search impossible. Meanwhile, dog rescuer Cheri Glankler took in a starving retriever that had collapsed at a nearby ranch last month, the Idaho Statesman reports. Based on the dog's initial disheveled appearance, it was clear she'd been living on her own in the wild, Glankler says. She posted photos of the dog on Facebook, and word quickly reached the Camerons that Mo may have been found. Looks like Mo lived off the fat of the land. Wow, I've been around that area, pretty rugged, let alone during winter. Legend is right.